City Surplus, Estates, Bankruptcies – Real Estate, Cars, Trucks, Boats, Antiques, Furniture, Box Lots, Tools, Firearms, Commercial Equipment and so much more! 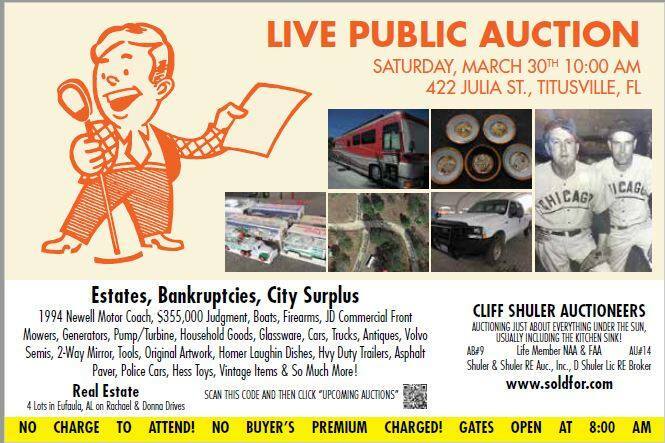 No charge to Attend-No charge to register – Auctioning just about everything, usually including the kitchen sink! No Buyer’s Premium! We do not believe in a BP! Auction begins at 10 am – Gates open at 8 am for registration & preview. Public Welcome! Please visit our website at www.soldfor.com for upcoming auctions and to view our catalog!